The Jewish Sound Archive is an active and growing collection used by a wide variety of patrons in a multitude of ways. Eastern European Studies, and folklore. 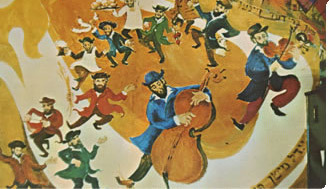 It is a source for those interested in the Jewish musical literature of the 19th and 20th centuries and contains a wealth of material of significant interest to scholars of Yiddish literature. The archive is a founding member of the Alliance of Judaica Sound Archives , formed for the purpose of furthering the goals of collecting, preserving and promoting the cultural legacy contained in Judiaca sound recordings. The other founding members are Judiaca Sound Archives at Florida Atlantic University Libraries (FAU) and the Feher Jewish Music Center of Beth Hatsfutsoth (Nahum Goldmann Museum of the Jewish Diaspora) at Tel Aviv University (FJMC). The goal of the Alliance is to establish an internet based closed network among its members to permit access to the sound recordings and other information in their respective collections. Links have been established with JSA so that sound recordings at FAU may be accessed by visitors to the Freedman Archive by the click of a mouse (assuming that the recording is in the Archive database). Conversely, visitors to the FAU website may access the background information in the Freedman Archive with respect to a recording at FAU by a mouse click. Thanks to the internet, the curators provide a music reference service. Queries have been received from Alaska to Uzbekistan, from performers, composers, clergy, educators, choral directors, music therapists, audio, video and film producers, authors and representatives of various libraries, academic and research institutions. Most interesting are the requests from individuals requesting that a song or prayer sung by a parent or grandparent from just a fragment or phrase which remained in memory. The curators have commented that these requests transmit a sense of loss and a sense of wanting connection. U of Penn Libraries | Support the Collection!